The tonsils function as the body’s initial line of defense in the mouth. As integral parts of the immune system, these structures protect the respiratory and gastrointestinal tracts by attacking any viruses, bacteria, and debris that enter the mouth. Your primary tonsils (the palatine tonsils) are located at the back of the throat, on the left and ride sides respectively. The adenoids (the pharyngeal tonsils) are near the nasal cavity, and the lingual tonsils are at the back of the throat. These structures can develop complications like tonsil stones. Many people undergo treatments for issues related to tonsil stones, as these lymphatic organs sometimes act as more of a liability to your health than an asset. When infection occurs, the tonsils can create significant health problems such as airway obstruction and greater susceptibility to repeated infections. Each tonsil is composed of an intricate network of crypts that contain cells that fight infection. If a foreign substance like a virus or a bacterium infects these crypts, the tonsils can trap the debris. Once the debris is trapped, it can combine with mucous from the throat or postnasal area and become concentrated into tonsil stones. Tonsil stones, also known as tonsilloliths, are the result of the trapped debris that has hardened inside crypts in the tonsils. These stones can be smelly and look like small, white chunks. They may sometimes become loosened and coughed up into the mouth. 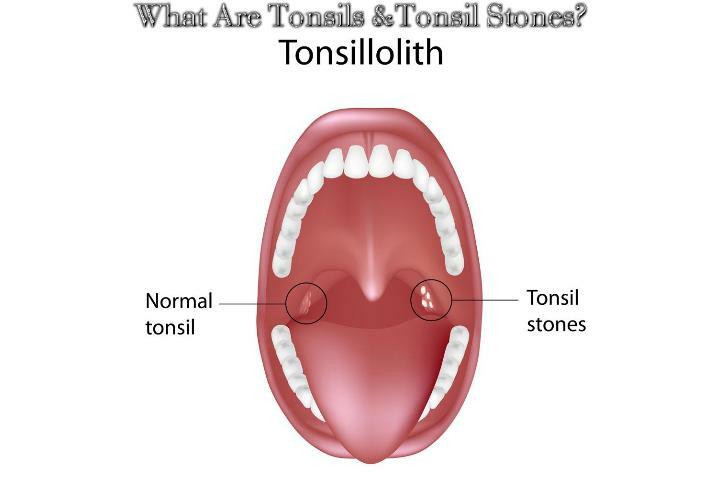 Individuals who suffer from chronic inflammation in their tonsils or repeated tonsillitis are the most at risk for experiencing tonsil stones, since frequent infections can cause the tonsils to become swollen, red, and inflamed continuously. If you are experiencing symptoms such as a sore throat, bad breath, or breathing issues, see your doctor or an ear, nose, and throat specialist. He or she can examine your head, neck, and mouth to determine the cause of your symptoms. If he or she observes that your tonsils are enlarged and have white, hardened stones, your healthcare provider may recommend the surgical removal of the stones. In some cases, the tonsils themselves may need to be removed to prevent frequent infections and stone-formation. Previous PostPrevious What Are The Causes Of Tonsil Stones? Next PostNext Who Can Be Affected By Tonsil Stones?